This page has coordinated pieces from Ayala Bar's FALL 2018 collections Coral Cave (classic), Heavenly Dawn (hip), Daydream (hip), Ethereal Presence (hip), Autumn Aurora (radiance), and Astral Light (radiance) ! 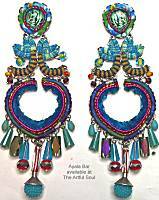 About the Fall Colors on this page of Ayala Bar jewelry! Coral Cave (classic) . . . teal blues and greens with muted gray, some splashes of sapphire and apple green. Autumn Aurora (radiance) . . . bright multicolor prints under glass, red, yellow, aqua, ivory white. Astral Light (radiance) . . . multicolor prints in various aqua and red combinations, wondrously detailed and not overly bright. Daydream (hip) . . . darker shades of teal blue and green with hints of cranberry and aqua, mixing the fabric and cords with bits of glass and crystal. Ethereal Presence (hip) . . . indigo blue with hints of purple, cranberry and gray in fabric tubes and cords. Heavenly Dawn (hip) . . . printed fabrics in rich turquoise and lime greens, mixed with vibrant fuchsia and warm golden mustard. Not all colors appear in every item. Choose pieces in the same color group if you want the best match. Sweetheart neckline shape with intricate metal shapes joined by multiple jump rings. 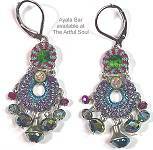 Tiny glass beads and fabric cords, crystals and fabric under glass cover the metal shapes, with strands of beads and freely dangling beads filling in gaps. 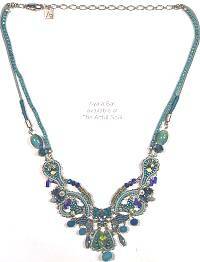 The ornate center design joins to color cords to the back chain and clasp. 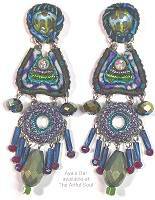 Print under faceted glass at the top, holds an element that is oval with pointed end defined by mosaic in tiny glass and crystal beads with cord, crystal bead fringe danced below in dark teal blues. Tiny shape ideal for most women, enough color to show up and lightweight. Print under faceted glass at top holds the fan-shaped mosaic of glass beads, crystal, cord and chain, the ornate metal flower design below holds dangling crystal drop. Striped cords bordering both section of this earring, mixed with some fuzzy cord, metallic coil, and hint of crystal. 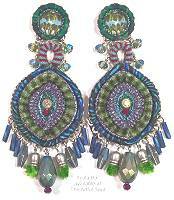 Fringe of beads includes oval fabric print under faceted glass. At top is print under glass framed by cord, at center is the triangle of cords wrapping around a crystal and color metallic coil, then a final open circle dangles at the bottom of piled cords and coils amid the dancing fringe of glass and crystal beads. 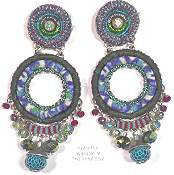 Lightly dancing on an earwire, circles of color cords work delightfully with sparkling crystals. 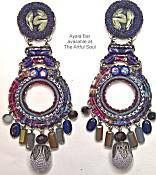 Ayala Bar jewelry has been handcrafted at the Ayala Bar studio in Tel Aviv under the strictest of quality control. The studio suggests that in order to keep it in mint condition, any contact with water, or prolonged exposure to heat, should be strictly avoided. Read about what others think of Ayala Bar jewelry! Instead of reviews for a specific product, this is a place to share about the designer line in general.